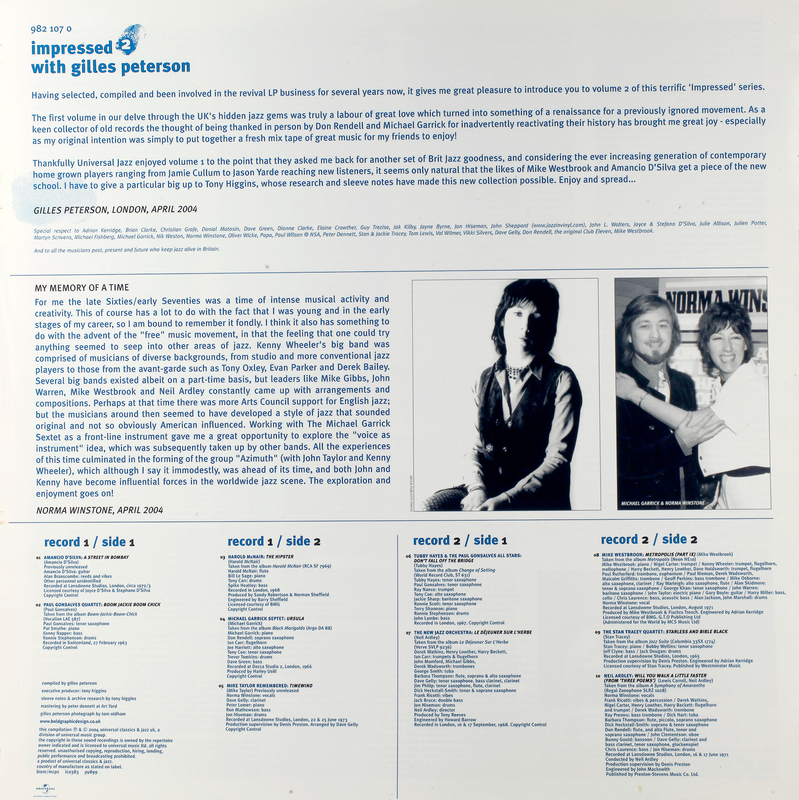 To continue the theme of British Jazz, now expanded to 1963-74, the second double album compiled by DJ of French origin, Gilles Peterson, Impressed 2 released on vinyl in 2004. Nice cover segue, with a second thumb print, it’s all in the detail. Michael Garrick, piano, harpsichord and celeste; Ian Carr, trumpet and flugelhorn; Tony Coe, tenor saxophone; Joe Harriott, alto saxophone; Don Rendell, tenor and soprano saxophone; Dave Green, bass; Trevor Tomkins, drums… additional drum and poetry, Colin Barnes. Eh? Poetry? As omniscient Google asks: Did you mean pottery? The Groove is strong with this one . . .
“Beat and Commercial” Records, a label which existed 1968-75, whose roster included prog-rockers like The Nice, Van Den Graaf Generator and Atomic Rooster, prog-folkies Steeleye Span and Lindisfarne, and Spyrogyra (not to be confused with Spyro Gyra, easily done), all of which which I’m going to pretend I can’t remember because I was too young! Totally untrue of course, I remember them well, but not this one. Sold it the same day I put it out, he added helpfully. Desirable, but taking one look at it (above) I probably wouldn’t have expressed an interest at the time. Ignorance is a terrible thing, and in such plentiful supply. The label Vocalion Dutton has apparently put out a reissue of these two main albums, however a mere CD compilation, so once again, Gilles strikes gold again with vinyl. Of McNair himself, his career was cruelly cut short by cancer at the age of only 39, in 1971, leaving a legacy of less than a handful of albums. Other Impressed 2 artists tracks: Boom Jackie Boom Chick! (Paul Gonsalves, title track! ), Rendell Carr Garrick! The Tubster! Stan Tracy! Cream of British Jazz titles in the late ’60s. I have only two as originals, sad face…but they are both very very good, happy face… Starless and Bible-Black (Stan Tracy not the King Crimson album 1974)…yeah. Speaking of English accents, several tracks feature the voice of Norma Winstone, voted top singer in the Melody Maker Jazz Poll of 1971, and a regular contributor to albums by Michael Garrick (pictured together on the insert). Norma is still with us, not long ago awarded an MBE ( Most Excellent Order of the British Empire). Shouldn’t that be MEOBE? The Insert – where they put the actual information. 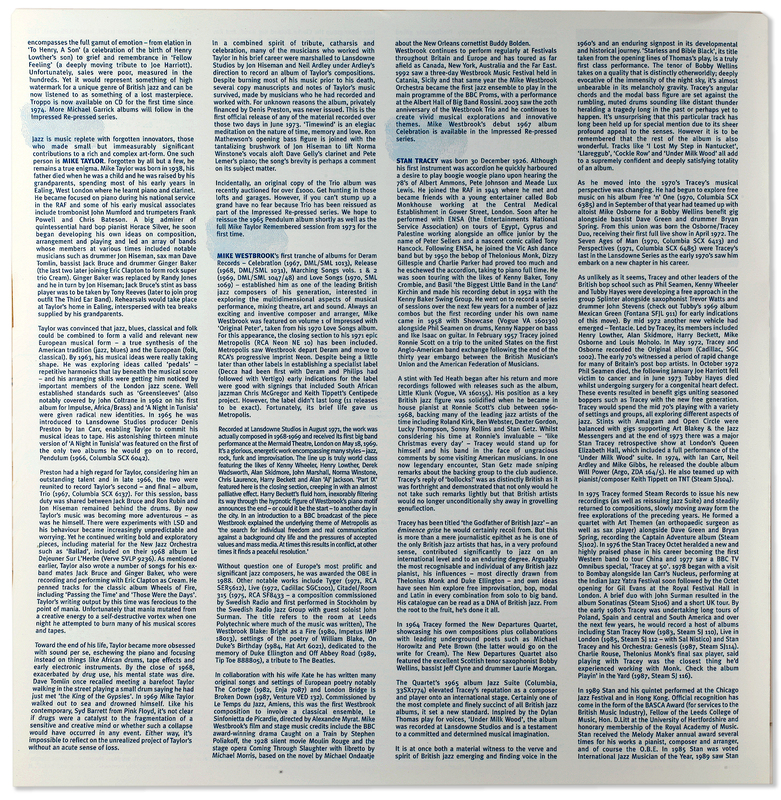 “Information” as to which tracks are on which of the four sides of vinyl is conspicuously absent. Apparently, information is old fashioned, nowadays you are lucky to know who’s album it is. You have to ask, then why tell us which record number and side number it is? There’s the tell. Information does matter, that white space is a modern conceit. Well, that’s how I read it. The pressing is stronger here than the first Impressed double, or at least my copy. More important, the engineering transfer quality is impeccable. Based on information surfacing as regards the first volume, original tape sources. I first stumbled on this (second) Peterson collection in a London record store, another of those joyous accidental discoveries, which led backwards to tracking down a copy of the first Peterson collection, previous post. As often, life rarely occurs in the correct order. “sat mat on the cat The” . Looking back to buying records in my teens, let’s say a few decades ago, we all eagerly awaited the next new release by our favourite artists. Record collecting today is a quite different enterprise: you never know from one day to the next what will turn up, by whom. As I have written before, the word “new”, which holds such influence over the music industry, has no force at all here – everything was new once. Now we have the entire historic musical canvas to look back over, and the joy of discovery, un-tramelled by the commercial conveyor-belt of newness. Much British jazz was from this golden age is entirely new to me, fifty years later. What a great time to be a music-lover, all this wonderful stuff, and still much more to discover. All the while, still luxuriating in the heritage of America. This is the spirit of DJ Jazz which Gilles and Jean-Claude represent. It seems a good spirit to me, an antidote to the jump-up-and-down mindless stuff. There is an appetite for the good stuff, not just the new stuff. Enough of the soapbox, LJC, time to move on. 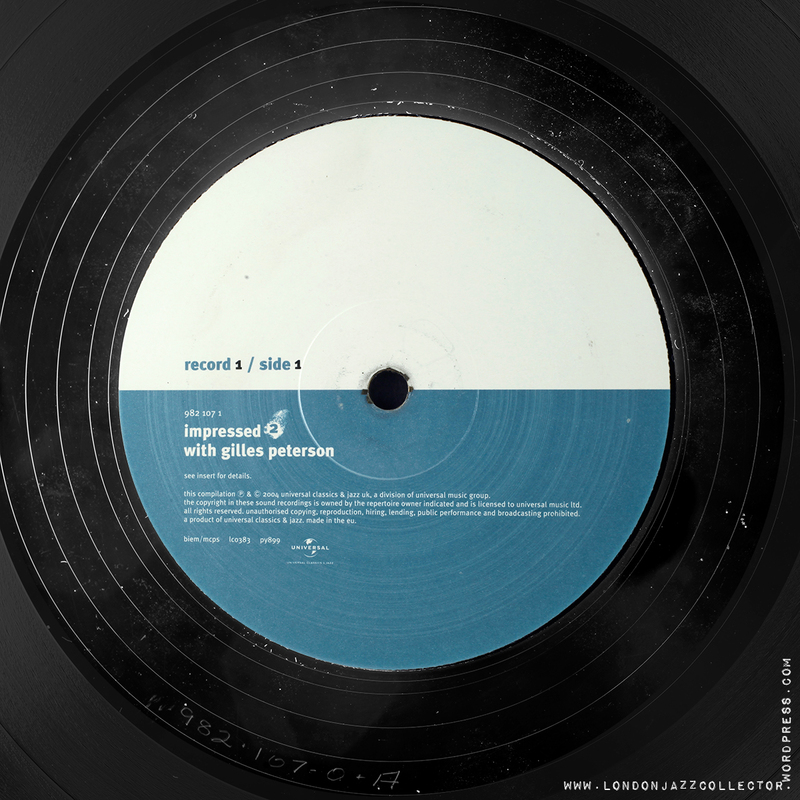 This entry was posted in British Jazz, Re-issue, sampler, Universal and tagged Gilles Peterson by LondonJazzCollector. Bookmark the permalink. I missed out on that whole Giles Peterson and Patrick Forge Sunday lunchtime at Camden Lock thing. Don’t remember where I was exactly but clearly it wasn’t Camden. Jean Claude’s vinyl emporium I came across a few years later in Soho just before the district lost all of it’s independent businesses and 95% of its character. Far as I can see only Ronnie Scott’s and Bar Italia are still there. But then I rarely visit the smoke these days, perhaps they’ve also gone. Jean Claude sold me a lot of vinyl and I even tipped up at the jazz “night” that he helped put on with a friend in a converted church in Penge, or was it Elmers End? Says it all about London that the naff little suburb twixt Anerley and Sydenham that we’d laugh about as kids became the successor to NW1. a hood where the jazz glitterati hang out. Anyhow I’m very grateful to J-C because a lot of what he sold me I’ve been able to re-sell on discogs for a healthy profit to help finance my jazz habit. 7″ singles seem to be all the rage with younger buyers and I bought significant quantities from J-C.
Harold Mcnair, Bogey Gaynair, Dizzy Reece Joe Harriot and Ernest Ranglin all went to the Alpha boys school in Kingston Jamica where they were mentored by Sister Mary Ignatius Davis a jazz loving nun. That’s a delightful and evocative snippet. Thank you. Hello LondonJazzCollector, I have quickly looked over your latest post, will get back to reading in detail when I can. Thank you for all the information about Harold McNair. I knew of him through his work (flute) on Steamhammer’s first album (don’t remember if he played on their scond album M.K. 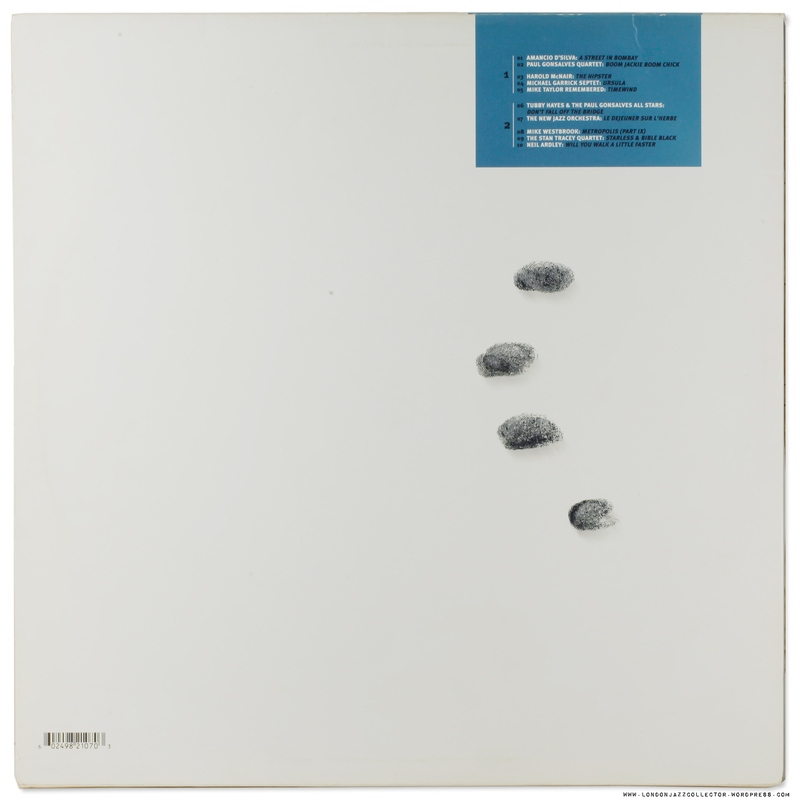 II – both were on CBS in the UK, released here in the States on the Columbia’s subsidiary EPIC records). I’ve read that Ginger Baker helped out his wife, when he was ill.
On a vaguely related note I heard a segment from John Mayer’ s Dhammapada on radio 3 recently which piqued my interest. CD only 2016 issue on firsthandrecords from a 1976 Denis Preston recording at Lansdowne Studios. Fantastic music, great recording and combined with two unreleased pieces from 1974. Recommended! Dutton Vocalion put the ‘Dhammapada’ out on CD about a decade ago so strange that it appeared again. Maybe the John Mayer estate was behind the second release? Like everything by John Mayer (including the ‘Indo Jazz Fusions 2’ CDs and ‘Etudes’), definitely worth hearing. Minor correction: You referenced Spirogyra. They were a somewhat obscure UK progressive rock/folk band featuring Barbara Gaskin. Spyro Gyra is a popular US “fuzak” band. LJC responds: That’s a relief! Certainly obscure enough for me to be unaware of them. Thanks for the redirection. The ‘Mike Taylor Remembered’ session with ‘Timewind’ was put out on CD and LP by Trunk Records some years ago. Worth seeking out ! I am a big Norma Winstone fan.I have a copy of her first solo album on Argo ZDA 148 stereo from 1971.Its called Edge of Time and features her great jazz vocal,sometimes very free and experimental in style.Jazz musician peer recognition is always a good test of musical talent and everyone is on this album e.g. Skidmore, Themen,Lowther Ricotti,John Taylor,Lawrence, Osborne ,Wheeler and more.NW performs a beautiful reading of Mike Taylors haunting Song of Love arr by Neil Ardley on the last track. 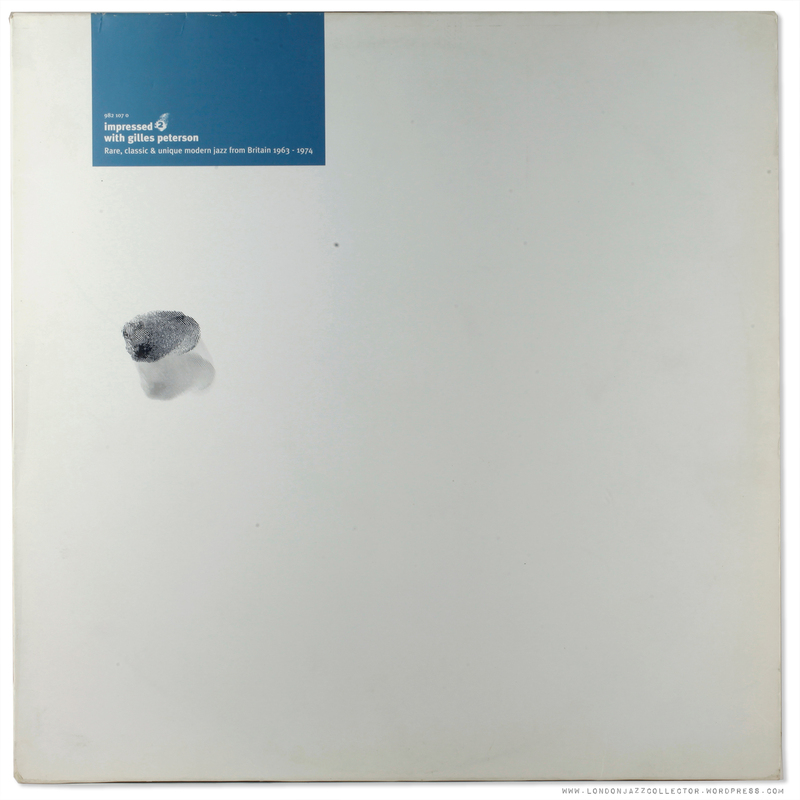 For a more “straight down the middle” approach from NW on an album including some jazz evergreen standards, try her excellent ECM album A Place Called Home. 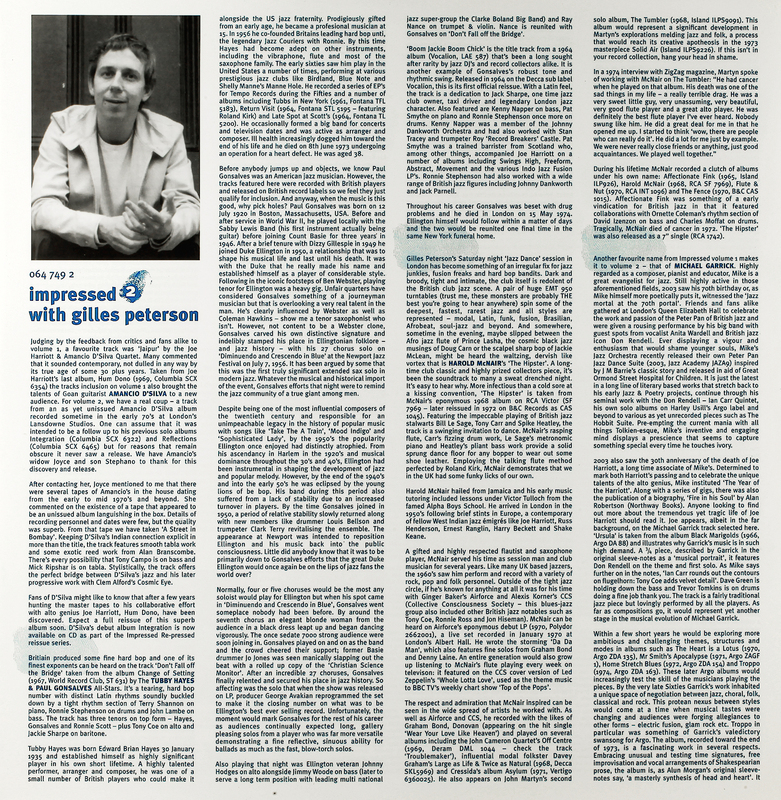 I must track down these Gilles Peterson albums as in many years record collecting,including British jazz, I haven’t even seen some of the albums from which the tracks are taken! 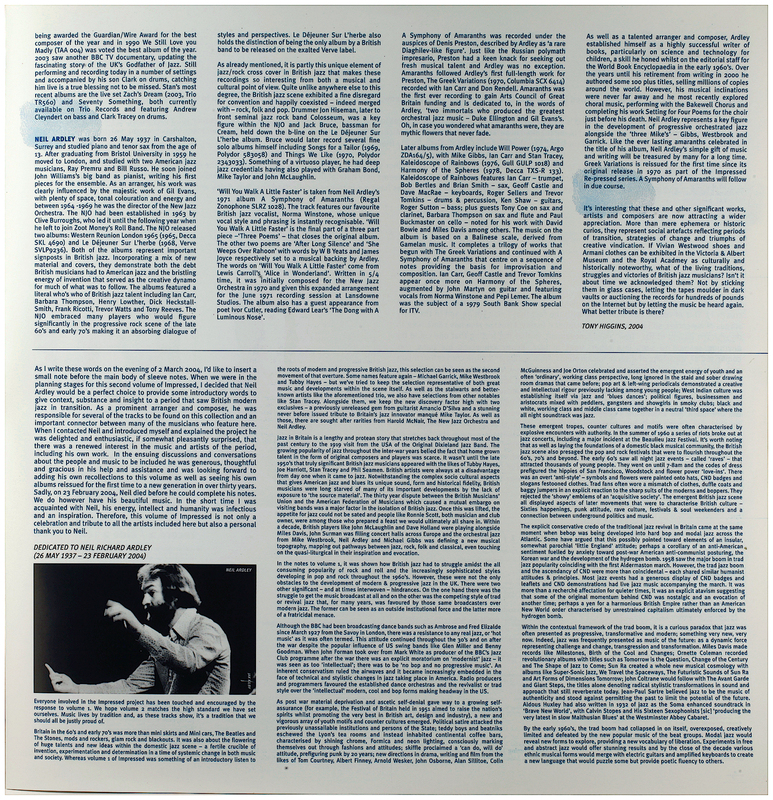 Correction – NW album on ECM is Somewhere Called Home – must be the heat! Norma Winstone has the voice of an angel, LJC. Check out her work with Kenny Wheeler [another UK treasure, by way of Canada], especially on his finest hour, the 1990 ECM, ‘Music for Large & Small Ensembles’. I’m in a minority on Norma, I’ve actually sold records because she was on them, or at least too prominent on them, she really doesn’t do it for me.